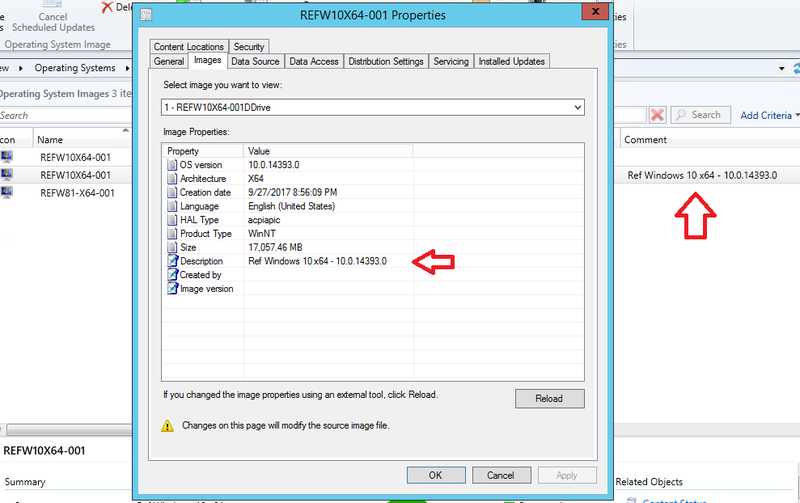 The default capture function in MDT does not add any description. It is not needed, but can be added by modifying ZTIBackup.wsf. In this case I added the Task Sequence Name, but you can add other things as will, like Task Sequence Description or Task Sequence version. I did this at a demo at Microsoft Ignite last week but I did not post it at that time, so here it is. sCmd = " /Capture-Image /CaptureDir:" & oDrive.Path & " /ImageFile:""" & sBackupPath & """ /Name:""" & sPrefix & Left(oDrive.Path, 1) & "Drive"" /Compress:MAX /ConfigFile:""" & sWimScriptPath & """ /ScratchDir:""" & oUtility.LocalRootPath & "\Scratch"""
sCmd = " /Capture-Image /Description:""" & oEnvironment.Item("TaskSequenceName") & """ /CaptureDir:" & oDrive.Path & " /ImageFile:""" & sBackupPath & """ /Name:""" & sPrefix & Left(oDrive.Path, 1) & "Drive"" /Compress:MAX /ConfigFile:""" & sWimScriptPath & """ /ScratchDir:""" & oUtility.LocalRootPath & "\Scratch"""